In the old days, people used to run their fridge on gas when they were on the move. Since then, we’ve all come to our senses and you should not operate gas appliances in a caravan when towing. This left us caravanners with a dilemma – how do you keep the contents of your fridge cold when you’re on the move? It’s all well and good to hope the fridge will remain cold when you’re just travelling a few hours, but on a long drive on a warm day up north, it simply isn’t feasible. The simple solution – assuming your fridge will operate on 12V – is to wire up a 12V connection from your tow vehicle to the van. Even though many wagons have a 12V socket in the cargo area, this typically won’t be good enough to run a three-way fridge in the caravan. The reason? Voltage drop. The voltage drop across 4mm automotive wire – the standard in many vehicles – is too great for a fridge, whether it’s an absorption fridge or compressor fridge. Even though a three-way absorption fridge can handle less than 12V due to voltage drop better than a compressor fridge, it still won’t cool the fridge if voltage at the fridge is much below 12V. The trick is to pump as much power into the fridge as you can. The best way of getting power to the fridge in your caravan is to run a minimum of 6mm wire directly from the battery. And now you get into the grey area that is wire measurement. In Australia, wire diameter is measured including the insulation. That might be helpful if you want to thread a wire through a small aperture, but for most us wanting to know about current capacity, it is a little strange. If you have 6mm wire as classified in Australia, you’ll actually have a diameter of about 4.5-5mm of copper wire, the rest being insulation. Anyway, this core diameter is compatible with running a caravan fridge in terms of voltage drop – provided you don’t have to run the wire more than about six metres. If you allow six metres of dual core 6mm cable for a vehicle that is about five metres long, you should have enough wire, provided that the wiring route is reasonably direct. If you’ll need more like seven metres to reach the rear of your vehicle, you will need to increase wire diameter or risk too much voltage drop. Once you’ve figured out what diameter and length of wiring you will require, you will need to consider the connection between vehicle and van. The standard fitment these days is the 50A Anderson plug. The reasons why it is favoured include its ability to carry plenty of current (while it is 50A rated, most fridges draw about 15A) and that it provides a positive connection. The other components needed include an inline fuse or a reset breaker switch and it is a good idea to fit a relay so that the plug is only powered on the vehicle’s accessory circuit. This is so that if you leave the fridge on and forget to unplug the Anderson plug for a period while the vehicle is not running, you don’t come back to a vehicle with a dead battery. Another solution is to fit a dual battery system with a switchover solenoid, but that adds expense and complexity. Word of warning: This How-To is based off an older 4WD, some modern utes and 4X4’s have much more complicated power systems that require specialist attention. If you are unsure or not confident about using our advice, please contact your manufacturer or see a reputable installer for help. Begin by threading the wire though the vehicle. There are a couple of ways of doing this. You can either run the wire underneath the vehicle, alongside or in the chassis rail into the engine bay, or run it inside the vehicle under the carpet and though the firewall into the engine bay. Although running the wire underneath can be easier, it is complicated by the need to ensure the wire isn’t hanging down anywhere or subject to chafing. The easiest place to start is in the cabin near the tap-in point for the accessory power, or at the rear of the vehicle. Try to avoid starting at the engine bay because you’ll probably end up having to thread nearly six metres of wire through a tight access grommet in the firewall. It’s much easier to thread a metre or so of wire from the cabin into the engine bay to the battery. Once you’ve routed the wire to the battery (but not yet connected), you can connect the inline fuse or reset breaker. While an inline fuse, once it blows, makes the circuit inoperative, it is probably a safer option than using a reset breaker, which will keep on tripping and resetting the circuit if there is a constant short. 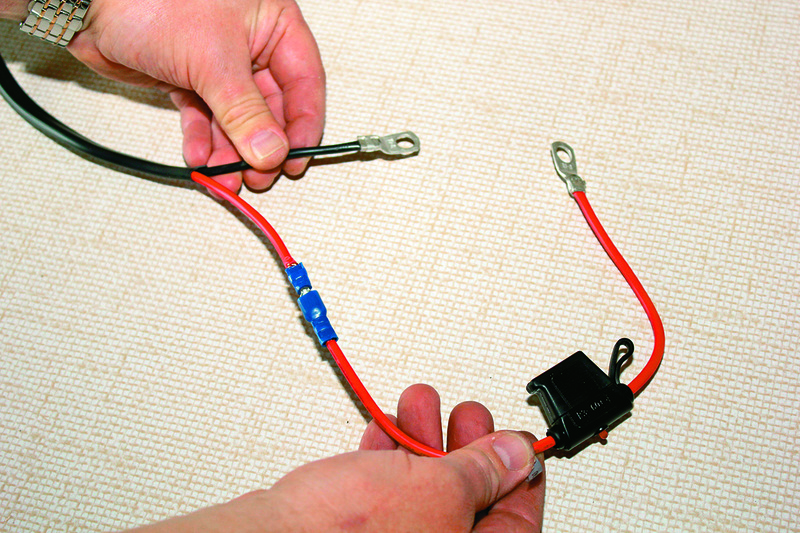 The inline fuse wire is crimped to the positive (red) wire of the dual-core 6mm wire and an eyelet is crimpled to the other end to fit to the battery’s positive terminal. Don’t make any connections to the battery now – that will be the final thing to do with this job. Crimp an eyelet connector to the negative (black) wire of the 6mm dual-core wire which will later be fitted to the negative battery terminal. If you’re fitting a relay to make the power source only operate when the vehicle is on (or in the accessories position) it can be fitted along the dual-core wire wherever a 12V accessory power feed can be sourced. 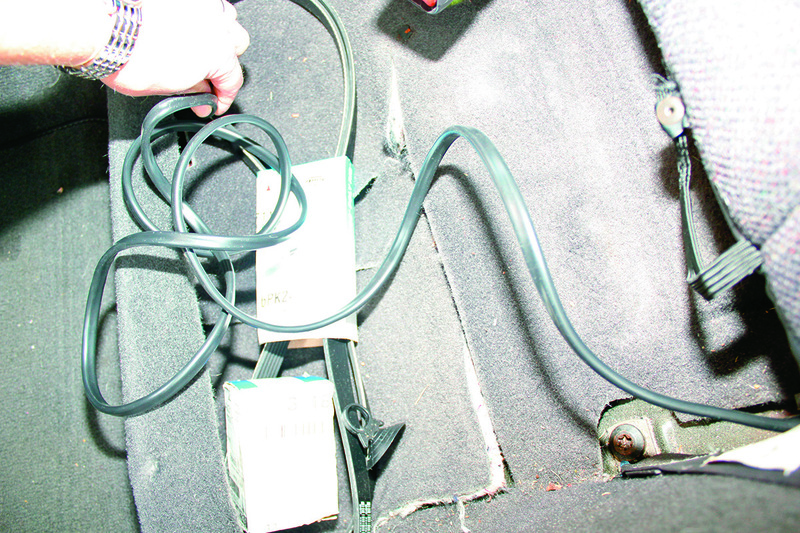 Often wagons have a 12V accessories plug in the cargo area that can be tapped into, but for this project we took the accessory power feed from a 12V source in the centre console (the cigarette lighter) to activate the relay. We hooked up this accessories power source to the connection pin numbered 86 on the relay and earthed it through the pin numbered 85. 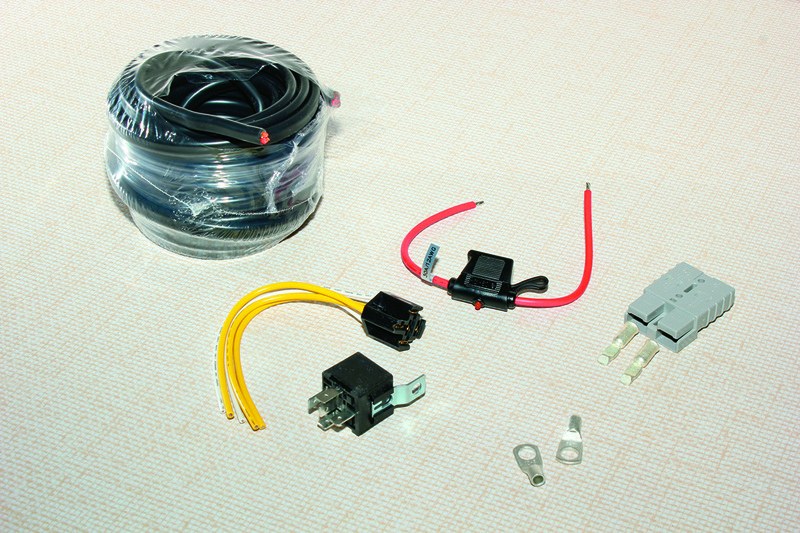 The dual core 6mm wire is cut here and with connectors crimped on, the wire from the battery is plugged into the relay at the pin numbered 30 and power out to the rear of the vehicle is connected to the 87 pin. The relay should be secured by either screwing it into an under-dash surface (provided it is clear if wiring directly underneath) or easier still, cable-tie the relay to a wiring loom or bracket. 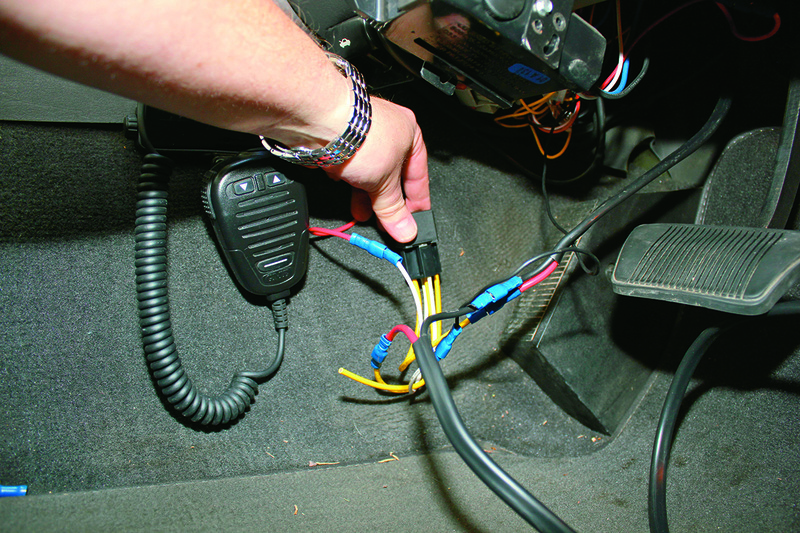 Make sure the wiring and the relay do not obstruct the foot pedals or steering column. 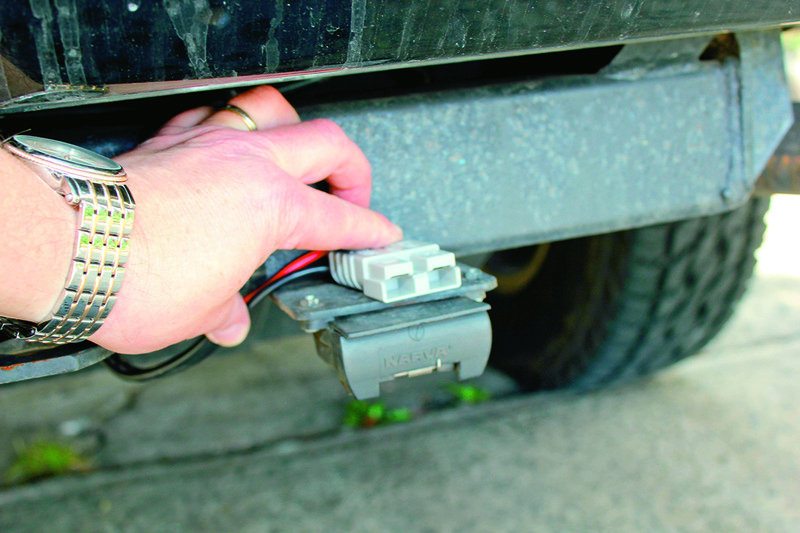 Once the wire has been threaded through to the towbar area near the standard trailer connector, the Anderson plug can be connected. We used an Anderson plug holder to attach the plug to the vehicle’s towbar. This neat accessory avoids getting debris and dirt in the connector. A heavy-duty crimping tool as we’ve used is not necessary, but makes the job much easier as the connector in the Anderson plug is quite large in diameter for a standard crimping tool. Crimp the connectors to the wire (ensuring you don’t mix up the positive and negative wires) and simply fit them into the Anderson plug. Finally, you just need to fit a 20A fuse into the inline fuse holder and attach the wires to the correct battery terminals. 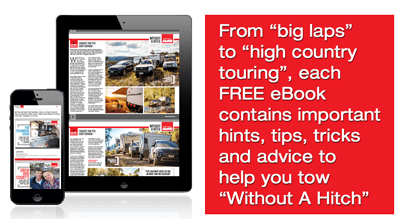 Then test your circuit works by putting a multimeter or a test light across the Anderson plug terminals with the vehicle’s engine running and the caravan’s fridge operating. The voltage at the Anderson plug terminals should be almost the same as at the vehicle’s battery terminals. The reason for doing this is that voltage can drop under load if the cable sizing is too small or there’s a bad connection. Gather the parts you’ll need for this job: 6mm dual core wire, a relay, inline fuse and connectors. 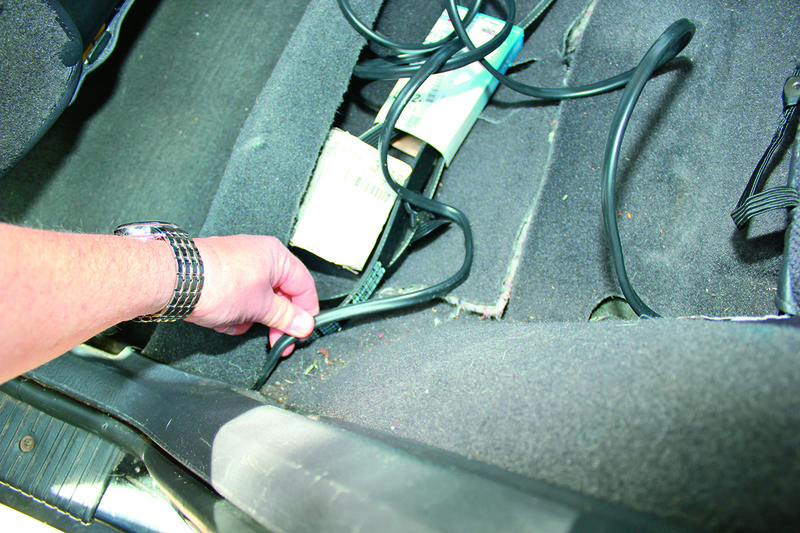 Start by feeding the wire from the rear of the vehicle. Continue to thread the wire though to the front of the vehicle via the shortest route. Wire up the relay and connect it (preferably) to accessories power. 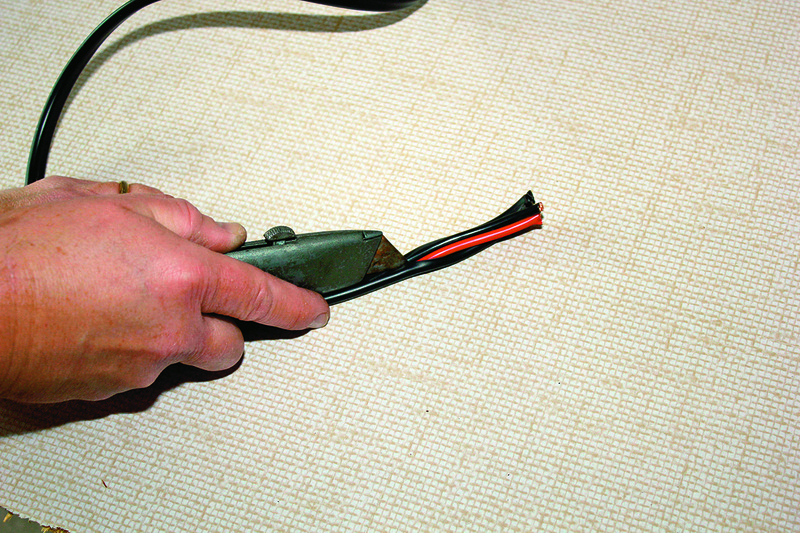 Cut the outer insulation of the wire to prepare the connections at the battery. Connect the inline fuse and connectors to the 6mm wire. 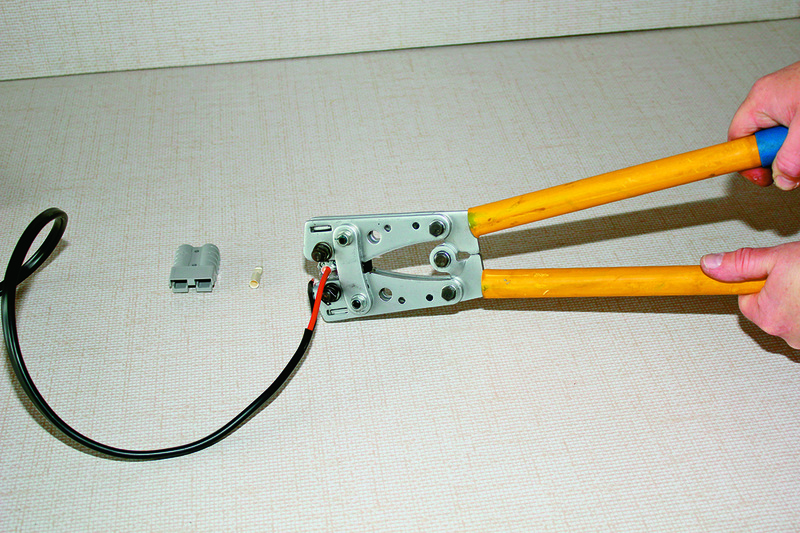 The inline fuse it connected to the positive wire. Attach the Anderson plug connectors to the 6mm wire. 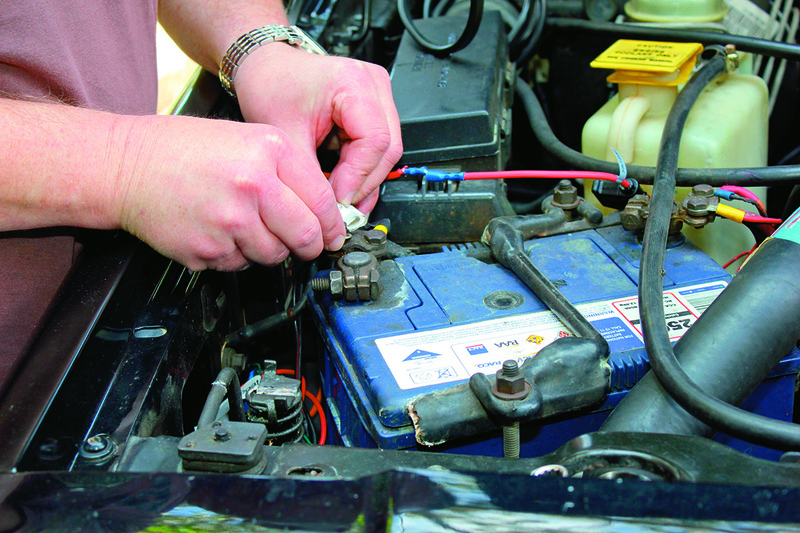 Attach the connectors to the vehicle’s battery, ensuring positive to positive, negative to negative.